Continuous glucose sensors for glycaemic control in the ICU: have we arrived? Dr Blixt and colleagues show in an elegant pilot study that the continuous measurement of glucose in venous blood by microdialysis in a central venous catheter is feasible in critically ill patients. The performance of this type of continuous glucose monitoring device equals the performance of the commonly used handheld blood glucose meters. But are we, as ICU physicians and nurses, now ready to implement such continuous blood glucose sensors into the daily practice of the ICU? The only yardstick to this is "are these devices truly helping us ...in our critically ill patients". Tight blood glucose control, within the range of fasting blood glucose levels, reduced morbidity in critically ill patients in the setting of well-controlled single-centre studies. Tight blood glucose control also lowered mortality in adult and paediatric patients after cardiac surgery [1, 2]. In contrast, the large, international multicentre clinical NICE-SUGAR study showed increased mortality in the patients undergoing tight blood glucose control . Due to NICE-SUGAR's pragmatic nature, variations in the essential parts of glycaemic control were allowed . Particularly, all sorts of glucose measurement methodologies were used: handheld blood glucose meters, bloodgas analysers and central laboratory measurements. Blood for the measurement could be of arterial, venous or capillary origin. Two major conclusions were drawn from this NICESUGAR trial . First, glycaemic control must be impor-tant in critically ill patients because its manipulation may decrease or increase mortality. Second, more attention is needed for the technological aspects of blood glucose control, notably the blood glucose measurements and the glycaemia control systems, that give advice on the insulin dosage . Hence, continuous blood glucose monitoring (CGM) devices could become an integral part of safe and effective glycaemic control in order to provide patient benefit, while minimising the workload for the nurses. The small (n = 10) implementation study by Dr Blixt and colleagues showed that, in patients who underwent upper abdominal surgery, the point accuracy of microdialysis CGM is in line with that of the handheld blood glucose meters, with a 95% confidence interval of ±2 mmol/l (36 mg/dl) [6, 7]. A similar study with the same CGM device in cardiac surgery patients yielded comparable results . These results were obtained in a time period of 20 hours and a context of tolerating hyperglycaemia up to 11 mmol/l (198 mg/dl). Clearly, this device is meeting the criteria for safety and performance, sufficient to obtain a CE mark (Figure 1): the device is safely measuring blood glucose levels withan acceptable accuracy in the normoglycaemic and hyperglycaemic range. Are we now ready for wide CGM implementation? Probably not, for two reasons. 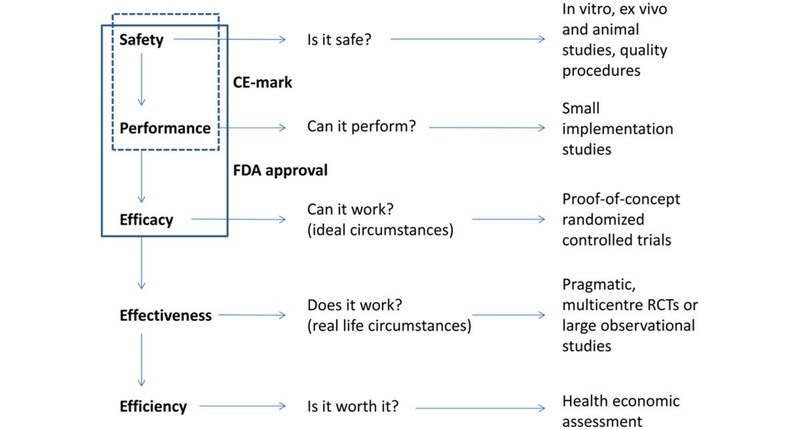 Roadmap for the testing of medical devices. Based on . FDA, US Food and Drug Administration; RCT, randomised controlled trial. First, for handheld blood glucose meters, such a level of accuracy is deemed insufficient to manage tight glycaemic control [9, 10]. For handheld blood glucose meters and the current CGM devices the 95% confidence interval range (36 mg/dl) is larger than the range (30 mg/dl) for tight glycaemic control (80 to 110 mg/dl). These sensors may also overestimate blood glucose levels in the hypoglycaemic zone. The presence of continuous data and the embedded trend information may compensate this moderate point accuracy in CGM sensors. If this was true, CGM should easily help us in realising tight glycaemic control while avoiding hypoglycaemia and increased blood glucose variability. Second, the clinical evidence is still too weak. Randomised controlled trials will be required to show that these devices can deliver this ambition in ideal circumstances (efficacy) and in the usual clinical setting of any ICU across the globe (effectiveness). A (subcutaneous) CGM device reached similar point accuracies (46 mg/dl), but in a single-centre efficacy randomised controlled trial the device only decreased the incidence of hypoglycaemia without improving blood glucose control or variability [11, 12]. The clinical community is now eagerly awaiting these randomised controlled trials with the newer CGM devices to decide on their applicability. The comparator in these trials should be the current gold standard of glucose measurements in arterial blood by a blood gas analyser. Additionally, change in patient-centred outcome measures of the glucose dynamics should be the focus of these trials . Such a roadmap may seem tedious and expensive for CGM validation. Nevertheless, this will be essential to convince the evidence-based medicine trained physician. Moreover, healthcare payers and society will pass the final judgement: is it worth it? Otherwise, expert nurses [1, 14] or computerised protocols [15, 16] using intermittent blood glucose measurements may remain the cost-effective gold standard. The point accuracy of a near-continuous blood glucose sensor with microdialysis through a central venous line is acceptable for monitoring in the normoglycaemic and hyperglycaemic range. However, the device is currently not good enough for blood glucose management within a narrow range. The clinical benefit and cost-effectiveness of these CGM devices still have to be demonstrated against the current gold standard of intermittent arterial glucose measurements in a blood gas analyser. The author is a senior clinical investigator for the Research Foundation - Flanders (FWO) and receives support from the Flemish Agency for Innovation by Science and Technology (IWT-TBM 100793). DM has received, through KU Leuven, speaker's honoraria and travel reimbursements from Maquet and Medtronic.